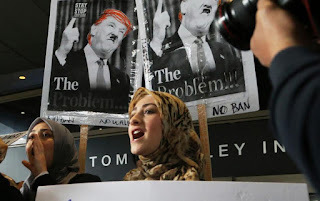 Women wearing traditional Muslim head coverings join demonstrators opposed to President Donald Trump's executive orders barring entry to the U.S. by Muslims from seven countries at the Tom Bradley International Terminal at Los Angeles International Airport on Saturday, Feb. 4, 2017. WASHINGTON (AP) — A federal appeals court on Sunday denied the Justice Department's request for an immediate reinstatement of President Donald Trump's ban on accepting certain travelers and all refugees. Trump mocked Robart, who was appointed by President George W. Bush, calling him a "so-called judge" whose "ridiculous" ruling "will be overturned." "Because the ban was lifted by a judge, many very bad and dangerous people may be pouring into our country. A terrible decision," he tweeted. But the government's brief repeatedly asserted that presidential authority cannot be questioned by judges once the nation's security is invoked. Congress "vests complete discretion in the President" to impose conditions on alien entry, so Trump isn't legally required to justify such decisions, it said. His executive order said the ban was necessary for "protecting against terrorism," and that "is sufficient to end the matter." "We'll win," Trump told reporters Saturday night. "For the safety of the country, we'll win." The State Department said on Friday that as many as 60,000 foreigners from Iraq, Syria, Iran, Sudan, Libya, Somalia or Yemen had their visas canceled. After Robart's decision, the department reversed course and said they could travel to the U.S. if they had a valid visa.